"A Long, Long Trail A-Winding........."
Researching the war service of a relative during the Great War can be a rewarding experience, but anyone wishing to undertake such a project must be prepared for disappointments or even the possibility of drawing a complete blank. However, when in 1993 I began to uncover the story of my Great-Grandfather, Private (later Company-Sergeant-Major) William Thompson M.M. and his service with the 1/6th North Staffords, I found it a very worthwhile undertaking. For me, the most moving part of my research was finding out about my Great-Grandfather's brother, John, who was killed in action in France. The results of my efforts culminated in my being the first member of my family to visit the memorial on which his name is inscribed, to remember the sacrifice he made all those years before. 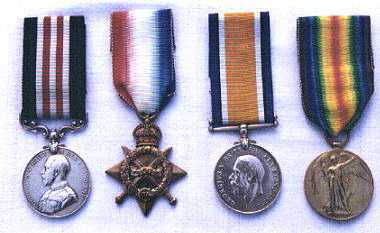 The Medals of Company Sergeant-Major Willam Thompson, M.M. William Thompson, my Great Grandfather, was a Territorial in the 6th North Staffords, having joined the "C" Company based at Tamworth in January 1912 with his brother, John. He worked at Hall End Colliery. By 1914 he was married, to Florence, and had a young daughter, Olive (my Grandmother), who was born on 15th March 1914. They lived in Shelton Street in Wilnecote, then a small mining village on Watling Street near Tamworth. When war was declared in August 1914, William was with the 6th North Staffords at the Staffordshire Brigade camp at St Asaph. After serving in Belgium, France and briefly in Egypt, he suffered burns to his hands in June 1917 and was evacuated. Unable to return to France due to his injuries he continued to serve as a Company-Sergeant-Major to the 5th (Reserve) Battalion of the North Staffordshire Regiment, a training unit based at Mablethorpe, where he remained until he was demobilised on 14th December 1918. These details were pieced together through a combination of basic research, educated guesses supported by background knowledge and sheer good luck! When I began the project, my primary sources were very scarce. Service details were non-existent. My main source of information were my Grandmother and my Great Uncle, also called William, who provided me with several pieces of information to work on. Firstly, they gave me his unit details, from which I was able to produce a background history of locations and actions in which my Great-Grandfather would have served. He had also told them stories of his adventures in the war. These were of a light-hearted nature and were apparently used to win a prize in a competition held at a social club in Picadilly, a mining village near Kingsbury in Warwickshire where they lived after the war, for the champion teller of tallest tale! However, as my subsequent research was able to confirm, these stories contained elements of truth. He would use various names, such as Major Peach and Captain Cherry, as the main characters for his tales. Both of these men actually served with the 1/6th and 5th Reserve Battalions of the North Staffords. Another story was that of his trek across the desert with only a tin of mutton fat for food. Again, a letter from George Lees, another Tamworth man, confirmed that rations during their time in Egypt in early 1916 were in short supply, with only one tin of Bully Beef between four! However, there was another side to my Great-Grandfather's experiences during the war which left him suffering with what is now termed as Post-Traumatic Stress Disorder. My Mother can also remember him still having the scars on his hands from the burns he had suffered years before. Unfortunately I only had one photograph of him in uniform, which had been given to me by my Great Uncle. 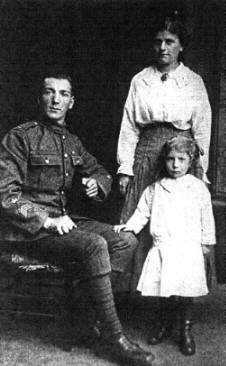 Taken in 1918, it shows him with his wife and daughter, wearing the ribbon of his Military Medal on his tunic and bearing the scars of the deep burns he suffered on his hands. I had never seen his medals as they were in the possession of another family member. During my research, these were also located, cleaned (as they were in a very neglected state), re-ribboned and mounted. After taking a photograph of these, I then returned them to their owner. Having found this information, I decided to try and find out about his brother, Jack, who I had been told about by my Grandmother. Finding out about Jack was going to be difficult as I had little background information. The few clues I did have came from my Grandmother. Firstly, she remembered that her Grandmother had a picture of him dressed in the full dress tunic of a hussar regiment. Another was that both he and my Great-Grandfather had met during the war without initially recognising each other. Their was also a recollection that my Great-Grandfather had also buried his brother when he was killed. However, as with all family stories, memory is not always reliable so again in-depth research was required. While scanning the 1/6th North Staffords entries in the Regiment's volume of "Soldiers Died in the Great War", and came across an intriguing entry. It contained the details of a 242565 Lance Corporal John Thompson, who was born in Dosthill, near Tamworth and was living in Wilnecote at the time of his enlistment. More interestingly, it also stated that the casualty was also "formerly 9686 15th Hussars". This was an important piece of information, as it confirmed that the photograph that my Grandmother had told me about had existed. In addition to this, the location of Lance Corporal Thompson's home village was the same as my Great-Grandfather's, therefore making him likely to be the man I was looking for. It also gave me a date of death - 24th May 1917. To confirm my hunch, I decided to make a trip over to Tamworth to visit the Reference Library there. I was handed the roll of microfilm containing all the issues of the "Tamworth Herald" for 1917, made myself comfortable in front of the microfilm reader and began to scan them carefully. This work can leave your eyes very tired and give you an uncomfortable backache if you have little to go on. However, armed with the date of death of Lance Corporal Thompson, I was able to search the newspapers from the beginning of June 1917 with the more certain chance of finding something. Sure enough, I found what I was looking for. On a single page of the 30th June edition of the "Herald", there was the very detailed obituary of Jack Thompson, with a further report on my Great-Grandfather William winning his Military Medal. This report gave me a massive amount of family information which I never had access to before, as well as photographs which I did not have. 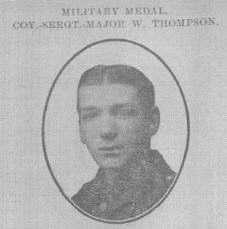 In all, four Thompson brothers served in the British Army during the Great War. The eldest brother, Joseph, had joined the Tamworth Company of the 6th Battalion, North Staffordshire Regiment, before the outbreak of war. However, he served during the war with a Siege Battery of the Royal Garrison Artillery on the Western Front until he was evacuated to Britain in 1917, suffering from severe frostbite. The youngest brother, Walter, joined the North Staffords after war was declared. He initially served with the 7th Battalion. In August 1915, Walter had landed with his battalion at Suvla Bay on the Gallipoli Peninsula. In November, he had been wounded and evacuated to Britain. By the Summer of 1916 he was serving with the 1st North Staffords on the Western Front and was again wounded at Delville Wood in August. After recovering from this wound he returned to France, only to be wounded again while serving with one of the North Staffords battalions in 59th Division north of Bapaume during the German retreat to the Hindenburg Line in March 1917. My Grandmother had told me about "Uncle Wal", who was only seventeen when he joined up, and of how he had severe wounds to his hands and body. One of the stories he used to tell her was of when he found a German in a trench. This man shouted "Kamerad - Wife and five children! ", to which young Wal replied "And me you bugger!" and bayoneted him. Obviously, this story was probably fictional, but there is no doubt that Walter had suffered during his service, the effects of which contributed to him dying prematurely in the 1930's. As for Jack Thompson, I discovered that he had also joined the Territorials of the 6th North Staffords in January 1912. He had then decided to join the Regular Army in January 1913, leaving his job at Hall End Colliery to enlist in the 15th King's Hussars at Lichfield. By January 1914 he transferred to the 1st Battalion, North Staffordshire Regiment, then stationed in Buttevant in Ireland. When Britain declared war on Germany on 4th August, the 1st North Staffords prepared to move to England with the 6th Infantry Division. "He was a splendid fellow and of great assistance to me on numerous occasions owing to the knowledge to which his wide experience had given him. I shall miss him very much indeed for he was a splendid example to my men. Even in your sorrow you have every reason for pride that your son was such a good soldier that he died nobly." "Jack and his two fellow Lance Corporals were three of the bravest chaps that put foot in that trench. The three killed 22 Germans and in their excitement chased the enemy over the top little thinking of the great risk they were taking. One chap who was very badly wounded, but got back alright, told me that Jack and his two pals were lying on the top throwing bombs and grenades when the German sniper shot the three of them." "COY. - SERGT.- MAJOR W. THOMPSON. of the North Staffordshire Regt has been awarded the Military Medal for bravery and devotion to duty in the field. The Officer of the company in conveying the news to Coy.- Sergt.- Major Thompson's wife, who resides in Shelton Street, Wilnecote, says: "Please accept the commanding officer's heartiest congratulations." 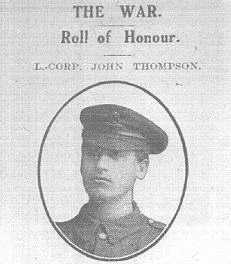 Coy.- Sergt.- Major Thompson, whose brother's death in action is reported today, also joined the Tamworth Territorial Company in January 1912, and went to France in February 1915. Since the information was received of the award of the Military Medal, Mrs Thompson has been notified that her husband has been wounded in both hands. Coy.- Sergt.- Major Thompson was formerly employed at Hall End Colliery." Armed with this information, as well as copies of the two newspaper photographs, I returned to the Staffordshire Regiment Museum and with the help of Jeff Elson, the attendant, found out about what happened on 24th May 1917. Before this, however, I returned to the 6th North Stafford's scrapbooks to find Jack's details. I located him in there with the same date of death and also that he was a member of "D" Company - as it turned out, the same as his brother William. On 30th April, after serving in "D" Company since Christmas 1915, William was appointed Acting Company- Quartermaster- Sergeant and was posted to "B" Company. I then began to piece together the events preceding and including the action on 24th May in which Jack was killed. The details of the movements of 1/6th North Staffords were provided by the War Diary. In Spring 1917, after training behind the lines at Ecquedeques, the battalion served as XI Corps Reserve at Beuvry. 46th (North Midland) Division, of which the unit was part, now moved towards the locality of Lens, the centre of the coal mining industry in Northern France, the landmarks of this activity such as slag heaps and pit winding gear still very in evidence in the sector, many of the "puits" were still active in the British sector only a couple of miles from the front. The Germans had also been in retreat in this area during April, due to the capture of Vimy Ridge by the Canadian Corps earlier in the month as part of the offensive at Arras. The town of Lens had been briefly abandoned but the Germans had now reoccupied it. The Germans had converted the ruins of the Corons into a network of fortified cellars, connected by trenches, all protected by a dense belt of barbed wire. Each cellar had been reinforced to sustain hits from artillery by covering them with concrete and old paving slabs. These shelters also contained tables, chairs and bedding, providing comfortable living quarters for the garrison. So hurried had been the German withdrawal in this sector that the former occupants had left large amounts of clothing behind. Also, the positions had to be reinforced again, as the protective measures had faced the British, leaving the trenches and cellars exposed to German artillery. On 1st May, the 1/6th North Staffords took over responsibility for the front line on the North - West edge of Bois De Riaumont, close to the River Souchez on the Lens - Lieven Road. After this period in the trenches, the Battalion became Brigade Reserve, based at a position known as the Red Mill, before moving to billets in Bully Grenay. Three weeks later, on 21st May, William was promoted Sergeant and at the same time became Acting Company Sergeant Major of "D" Company. Both of the Thompson brothers were now serving in the same company again. "7 p.m. Intense barrage opens which was followed by the attack which resulted in most of the objective being gained and subsequently consolidated. Several bombing encounters during the night all of which were repulsed. During these operations 30 prisoners were taken, five of whom had been wounded. 25TH MAY Nash Alley - Completed consolidation of captured ground. HQ - ELVASTON and HARRISON CRATER A & D - OLD GERMAN FRONTLINE B & C - QUEEN ST"
"On Thursday 24th May, the 137th Brigade (Cambell) Was ordered to attack and capture NASH ALLEY from N1 a 98.40 to N1 78.90 and NETLEY TRENCH between NASH and NOVEL ALLEYS. For this the 6th North Staffords (Stoney) were detailed. At 7p.m. this battalion launched its attack. It was Empire Day. This proved to be a good omen, for all the objectives were gained with slight loss and 28 prisoners secured. These belonged to the 153rd Regiment of the 8th Division (German). It is an accepted fact that given sufficient artillery support, enemy trenches and strongholds can almost always be penetrated. The holding of the position is the difficulty and quite another matter. So it turned out to be the case. During the night the work on consolidation was energetically carried out and several local bombing attacks were successfully repulsed. By this time all the officers had become casualties and the Second in Command, Major Macnamara, had been sent forward to take charge. Subjected to artillery fire since their occupation, the captured trenches had been badly damaged. During the morning of the 25th May, every available German gun was brought to bear on this small front and under cover of this heavy barrage the enemy deployed from his communications trenches and counter - attacked about noon. The Germans came in close formation across the open into NASH and NETLEY Trenches. His strength was estimated at one battalion. Shaken though they were by this hellish artillery fire, the remnants of the companies involved fought a splendid rearguard action and retired to the trenches from which they had started the previous evening. Unfortunately, Major G. Macnamara, Wiltshire Regiment, attached as Second in Command of the 6th North Staffordshire Regiment, was hit during this retirement and died of his wounds. No further attempt was made to retake the lost ground and the battalion after relief was withdrawn to Noeux - Les - Mines for a few days rest." Having consulted the War Diary however, I was no nearer discovering for what specific actions my Great-Grandfather had gained his award. However, it could be speculated to that he probably took charge of his Company after the officers had become casualties either during the defence of Nash Alley or the subsequent withdrawal. However, I was able to pinpoint a date on which he was recommended to receive the Military Medal, as on 29th May, the 1/6th North Staffords were visited at Neoux - Le - Mines by the Divisional Commander, Major General W. Thwaites, who congratulated them on their work in the assault on Nash Alley. He would have been awarded a Military Cross if he had been a full Company-Sergeant-Major, but as he was only serving in an acting capacity and was actually still a Sergeant, he received the Medal instead. The War Diary also provided me the information that on 8th June, Battalion Headquarters received the news that 240107 Acting Company Sergeant Major William Thompson had been awarded the Military Medal, with the decoration being gazetted in "The London Gazette" of 18th July 1917. I was also able to determine the circumstances in which he was wounded. On 6th June, a German trench mortar bomb had set fire to a Company dump, where grenades and Very lights were being stored. The whole dump was in danger of exploding, therefore the remaining stores had to be removed from the fire, the burning boxes being thrown out of the trench. William suffered severe burns to his hands while helping to remove the stores to a place of safety. Despite his wounds, he remained with the 1/6th North Staffords until 11th July. One issue still remained outstanding after this research - did Jack have a marked grave or was his name carved on the panels of a memorial somewhere in France. I contacted the Commonwealth War Graves Commission in Maidenhead and, as usual, they were most helpful in providing me with the exact place where he is remembered. His name is recorded on the Arras Memorial to the Missing at the Faubourg d'Amien Military Cemetery in Arras. From the research I had done, it seemed very unlikely that Jack's body was ever recovered, due to the heavy shelling and machine-gun fire and the nature of the fighting. Perhaps the story of my Great-Grandfather burying him was intended to soften the blow for his parents. When I received this information, I made plans to visit the memorial as soon as I could. I am a regular visitor to the battlefields of France and Belgium, so I managed to visit the memorial during a trip I made with Flanders Tours in July 1995. On Armistice Day 1994, I had visited R.E. Farm near Wulverghem where both William and Jack had served. One of the men buried in the cemetery there, Private Fred Gadsby lived in the same street in Wilnecote as my Great-Grandfather and Jack had been taken there after being gassed, as the farm was a location of 1st North Stafford's Regimental Aid Post in April 1916. I have visited graves and memorials many times, having done research on individual soldiers for a few years, but this visit was different - more personal and emotional . I made my way towards the North Stafford's panel, scanned the columns of names for the Lance Corporals, and then focused on Jack. This was the first time that anyone from his family had been able to visit the place where he is commemorated. I looked up at his name for a few moments, with the satisfaction that I had been able to achieve what I had set out to do two years before, and that my research had made him exist again. It was also sobering to think that at 24, I had already outlived him by one year. I carefully placed my poppy spray at the foot of the column and left the cemetery. Jack was no longer missing, and as long as I am around his memory will kept be alive. Since my article first appeared on "Hellfire Corner" in December 1996, I have had dozens of e-mails from people carrying out research into their relative's service in the Great War. In the summer of 1999 I was contacted by Peter Golden, who found the article of particular interest to him as his great-uncle, Second-Lieutenant Hubert Plant, was returned as missing, presumed killed following the attack on Nash Alley by the 1/6th North Staffords on 24th May 1917. He very kindly sent me some information about his great-uncle that shows how another family was affected by the outcome of that attack. Hubert Plant came from Burton-on-Trent and was commissioned on 11th June 1915 into the 2/6th Battalion of the North Staffordshire Regiment. He was later posted to the 8th (Service) Battalion of the regiment, serving with 19th (Western) Division. On 9th May 1917, he joined 1/6th Battalion, which was by that time operating in the coalfields south of Loos and Lens. He was posted as missing following the attack on Nash Alley. Second-Lieutenant Plant's body was never recovered and he is commemorated on the same memorial as Jack Thompson, the Arras Memorial in the Faubourg-d'Amiens Cemetery. "It is with deep sorrow I have just heard that 2nd Lieut. Hubert Plant reported "missing" a few weeks ago has now been reported as "killed in action". As everyone at St Paul's knows, Hubert Plant was the youngest son of our late organist, Dr Plant. He was, as a boy, in the Choir of St Margaret's and then in St Paul's. He took the deepest interest in music and in one of his last letters asked that Dr Plant's compositions might be bound up in one volume for him. He was also a bell-ringer at St Paul's. Not only his relatives but a wide circle of friends will lament his death." Normal trench life continued until 22nd May when the battalion went back into the line and made preparations for an attack, which was to be made on 24th May. The objective was about 300 yards of enemy trench on a hill, which was a commanding position and dominated the country NW of Lens. The enemy trench was known as "Nash Alley". During the previous days the plan and formations were carefully worked out and every man taking part in the attack was detailed to a particular duty. The communications trenches were deepened and the front line trench "Novel Alley" was improved so that it could be used as an assembly trench. The improvements were important because the attack was to be carried out in daylight and consequently it simplified matters if the troops could assemble in daylight. Dumps of ammunition, bombs, water, wire and everything necessary for consolidation were made near the front line in convenient positions for taking forward to Nash Alley which was about 800 yards from the front line. The artillery cut the wire and bombarded all M.G. posts, which had been located. During the night before the operation, part of the battalion front was taken over by "D" Company of the 6th South and the battalion was left with the front of attack only. This piece of front was divided between "C" Company (Captain McGowan) and "D" Company (Captain Wragg). These two companies were to lead the attack. "B" Company (Captain Shedding) was in support and "A" Company (Captain Hogarth) in reserve. The attack was carried out at 7 p.m. on May 24th under an excellent barrage of artillery and machine-guns. The objective with the exception of a trench junction on the right was gained and consolidated. Great credit is due to Regimental Sergeant-Major Sloane for the wonderful way in which he got the necessary ammunition up. During the night the enemy made several minor counterattacks down the communications trenches, particularly on the left where "C" Company was. Captain McGowan played a great part in helping to repulse these attacks and was indefatigable. Later he was wounded but he continued and made certain that the enemy was not to be allowed to regain the trench. Unfortunately in a later attack he was killed and the battalion lost a gallant officer who had no thought for his safety. He was a great loss and was much mourned by all ranks. Thirty prisoners were taken in this operation, five of whom were wounded. At this time, this was a record number of prisoners and the battalion was very proud. Next morning, Major Macnamara was sent up to make arrangements to capture the piece of trench which the battalion had failed to take on the previous day. A little later in the morning - about 10 a.m. - from the battalion headquarters which were located in a crater near Hart's Crater it was noticed that some of the enemy's heavy artillery was registering on the principal points on the line. At 11.30 a.m. the enemy opened a barrage with heavy artillery on Nash Alley and other points in the Staffordshire front. He continued this for half-an-hour, and at noon launched a heavy counter attack. It was very well executed. The enemy assembled in a communication trench on the flank and wheeled round into a line to the attack. Before he had appeared our artillery had opened fire onto those trenches and the machine-gun fired in enfilade, but this failed to stop him, and he regained possession of Nash Alley and any of the 1st/6th who were left alive were overwhelmed and taken prisoners. Major Macnamara was hit by a shell on the way back and was rendered unconscious. He died about half an hour afterwards while he was being brought back to the aid post. 110 men wounded; and 37 missing. It was a heavy casualty list, but not more serious than had been inflicted on the Boche. The object of the attack was to make the enemy think the Battalion was about to attack him and thus prevent him taking away his reserves. According to intelligence this result was achieved, and in mourning those brave men, the survivors were consoled by that thought. The battalion was relieved the next night, and after a night in support, they marched out to Nouex-les-Mines for a few days rest. "C" Company were the leading company, as they had had the most difficult task; the whole Battalion was proud, and marched in with heads in the air and a cheery song on their lips. On May 29th, Major-General Thwaites inspected the Battalion, and congratulated them on their success. On the 31st the Battalion went back into the same part of the line and resumed it's normal life. It was learned that C.S.M. Thompson, Lance-Corporals Washington, Freeman and Horne had been awarded the Military Medal for their gallantry in the Nash Valley attack. Captain N. Hannah, Lieutenant J.H.M. Yeomans, and Second-Lieutenant C.E. Hedges were awarded the Military Cross and Sergeant J. Rose the D.C.M. for the same operation. "During the attack on Nash Alley, S. E. of Loos, he showed conspicuous gallantry; he had control of the mortars under his command, and kept his guns continuously in action. During the counter-attack his forward guns were completely buried by hostile shelling. He, however, although a terrific barrage was going on at the time, succeeded in bringing his guns back to safety, and placing them in readiness to fire again. He took charge of and collected a party of infantry who were left without an officer, and led them forward to the evacuated trench, and established bombing posts, afterwards reporting to the Infantry Commander his positions. During the whole of the preliminary period, and during the attack, Lieutenant Gibson showed remarkable courage and devotion to duty, and set a splendid example to his men." Harold Gibson, who was later to be promoted to the rank of Captain, was also Mentioned in Dispatches during the war. Lieutenant Yeomans came from Burton-on-Trent and was the eldest son of Mr A. H. Yeomans, who was a director of the Marston, Thompson and Evershed brewery. He had been wounded during the attack on the Hohenzollern Redoubt on 13th October 1915, receiving a bullet wound that pierced one of his lungs. "For conspicuous gallantry and devotion to duty. During an attack and subsequent consolidation of a position he worked untiringly for seventeen hours, organising and leading bombing parties, strengthening his defences, and making every endeavour to hold a difficult position. He was finally very severely wounded during an enemy counter-attack. He set a magnificent example to all ranks." "For conspicuous gallantry and devotion to duty. When in charge of a blocking party he showed great courage and determination in driving back several bombing attacks. He held his post against an enemy counter-attack in superior numbers, and by his coolness and tenacity saved many of his comrades." Lance-Corporal Horne, who came from Arelwas, later reached the rank of Lance-Sergeant. He was killed on 28th September 1918 near Bellenglise and is buried at Bellicourt British Cemetery, Plot 3, Row D, Grave 10. Battalion Headquarters was notified that the above awards had been made on 8th June 1917. In April of this year, I visited the area around Loos and Lens with my sister. She had never been over to the old Western Front before and found the experience very moving. We both visited the Arras Memorial to the Missing and I was able to show her Jack Thompson's name amongst those of his fellow North Staffords. He is still remembered.